23rd July, 2016, New Delhi: Netsurf one of the leading direct selling companies in India, with a strong portfolio of agriculture products for organic farming, today announced the launch of two unique products to further boost the cause of organic farming in India. Netsurf has today announced the launch of two unique products to further boost the cause of organic farming in India. Established in the year 2000, Netsurf is one of the leading direct selling companies in India. Netsurf has introduced numerous innovative and result-oriented products in the market in last 15 years. Today more than million farmers across India are using Netsurf products with a great success. Netsurf manufactures and develops these products in its captive manufacturing facility at Jejuri. The agriculture unit is fully equipped to process production for multiple categories and currently carries out production for categories like Microbial Bio-fertilizers, Micro Nutrient Fertilizers, Microbial Bio Pesticides, Herbal Bio pesticides & Plant Growth Promoters. Launched under the Brand Name Biofit the two organic products launched by Netsurf are – Cattle Feed Concentrate (CFC) Plus and Wrap Up. Both the products have been totally researched and manufactured in India at the company’s Department of Scientific and Industrial Research (DSIR) accredited state of the art agriculture plant at Jejuri (Maharashtra). 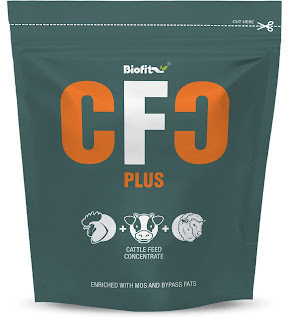 Netsurf’s CFC Plus is advanced formula addressing livestock nutrition. It is enriched with Pre biotic and Pro Biotic, essential Fatty Acids, Vitamin E, Selenium and Digestive Enzymes that help in better feed utility for the animals. The new product increases in the milk yield by 10%-15% and also increases fat percentage and protein content in the milk. It also helps in increasing lactation period and sustains milk production even under stress conditions and also majorly helps in preventing metabolic disorders. The new product also enables better growth and development of skeletal system and helps in maintaining the skin coat luster. Netsurf’s Wrap Up is a plant defense booster derived through a culture of microorganisms. Once applied via foliar spray, it provides plant protection against microbial infection by forming a thin coat on the applied parts of the plant. This creates a structural barrier, which helps plants to defend microbial invasions. In addition, the metabolites from microorganisms act as a growth enhancers helping the root systems to absorb more nutrients. In addition, metabolites secreted by microorganisms help in root system development and photosynthesis, thereby promoting and enhancing plant growth. The new product offerings also are in line with governments various initiatives to promote organic farming in India. Under the Paramparagat Krishi Vikas Yojana (PKVY) which is also known as "Traditional Farming Improvement Programme" promotes organic farming through adoption of organic village by cluster approach and organic certification. Organic farming will be promoted by using traditional resources and the organic products will be linked with the market. In order to implement the PKVY in the year 2015-16, an amount of Rs 300 crore has been allocated. A sum of Rs 412 crore has been allocated by the government to implement the PKVY in the financial year 2016-17. Speaking about the new product offerings, Sujit Jain, CEO & Managing Director, Netsurf communications P.Ltd. said, “Since inception we have introduced numerous innovative and result-oriented products in the agriculture sector. Netsurf has always tried to help its consumers to solve their day-to-day problems more effectively with these products. I am confident that these two new products will further help the farming community. The new product offerings are in line with governments various initiatives to promote organic farming in India. Organic farming in India is gaining a lot of momentum. There is tremendous growth in demand for organic agriculture products in the last few years. The number of organic farmers in India is on high”. Established in the year 2000, Netsurf is one of the leading direct selling companies in India. Netsurf has always been a progressive company in its approach, be it products systems & processes. Netsurf has introduced numerous innovative and result-oriented products in the market in last 15 years. Netsurf has always tried to help its consumers to solve their day-to-day problems more effectively with these products. Netsurf has made a significant investment in its research & development and manufacturing facilities. As a result, individuals from various walks of life have always opted for Netsurf as an impeccable long-term career opportunity. Netsurf operates in more than 22 states & 300 districts of India covering 0.7 million independent distributors.